At Mayfair Foods Ltd we are always thrilled to launch a new product! This time we’re shouting about our fantastic Certified Gluten & Dairy Free Quinoa! Naturally free from the 14 Main Allergens, this on trend ‘super food’ can be tested and certified allergen free to suit individual customer requirements. 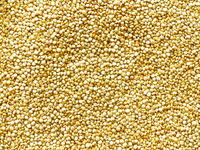 Quinoa is available as Conventional or Organic product and can be White, Black or Red & contains more protein per serving than rice, millet or wheat. Quinoa can be a great addition to a healthy lifestyle – low in calories and high in key nutrients such as amino acids fiber, polyunsaturated fatty acids, vitamins & minerals. Stock available now and for shipment on larger contracts, speak to us about your requirements today!